Brando Palermo slipped around his lovely bride to open the front door for her. Before he could give her a goodbye kiss, however, she stopped in her tracks. Her smile turned to worry. “Brad,” Mary asked, using his preferred nickname. “Are you sure you two will be okay while I’m gone?” She placed her hand on his hand holding the doorknob, her expression worried. Brad stepped close enough to kiss her, but she turned away. He settled for a kiss on the top of her head. Even casual jeans and a T-shirt couldn’t diminish how great she looked to him. “We’ll be fine. It’s not like I haven’t babysat my nieces before, y’know.” His sky-blue eyes sparkled in his olive-skinned face as he chuckled and pulled the door open for her. “It’ll be good to actually do guy stuff for once instead of tea parties. Michael will be safe in my hands, honey. Now get going before you’re late.” He gave her a boyish smile as she stood next to her great-aunt’s grandfather clock. He shook his head firmly enough to make his short black hair wave. “Stop right there, honey. Yes, he likes me, and we’ve known each other for almost a year now, and I think it’s time to give me a chance, since I’m now officially his stepdad.” He waved his arm down the entry way at the kitchen where the brown-haired seven-year-old sat at the table and colored in his latest coloring book, ignoring the drama down the hall. “And I love him almost as much as I love you, my bride.” He leaned forward for a kiss on her lips. “Besides, I’m a contractor, remember? If I can supervise twenty-plus workmen, five roofers, three electricians, and two plumbers on a jobsite and end up with a house, I can take care of one kid for a day.” He grinned at her soft laugh, but her face still showed lingering concern. Brad stepped back a half-step and gave her a look of exasperation. With a tiny smile, she walked to the car. He watched her get in, and waved as she backed out of the driveway. Michael pretended not to hear so he wouldn’t have to stop playing the video game. When Brad shut off the console he jumped off the floor to protest but his stomach gurgled first. Michael put his hands on his stomach and looked down at it. “Quiet, I wanted to play some more.” Brad tried not to laugh at Michael and his stomach having a conversation. “Maybe after lunch.” As Brad put his hands on Michael’s shoulder to herd him the right direction, the doorbell rang. Michael ducked underneath his hands to run over and answer the door. Brad followed. The UPS guy had to pass it up high to keep the seven-year-old from grabbing it. “Good afternoon,” the guy said before he turned around and jogged back to his truck. “C’mon, Mom probably ordered it for me,” Michael whined then he jumped for it. Michael followed him all the way to the kitchen, jumping for the box. 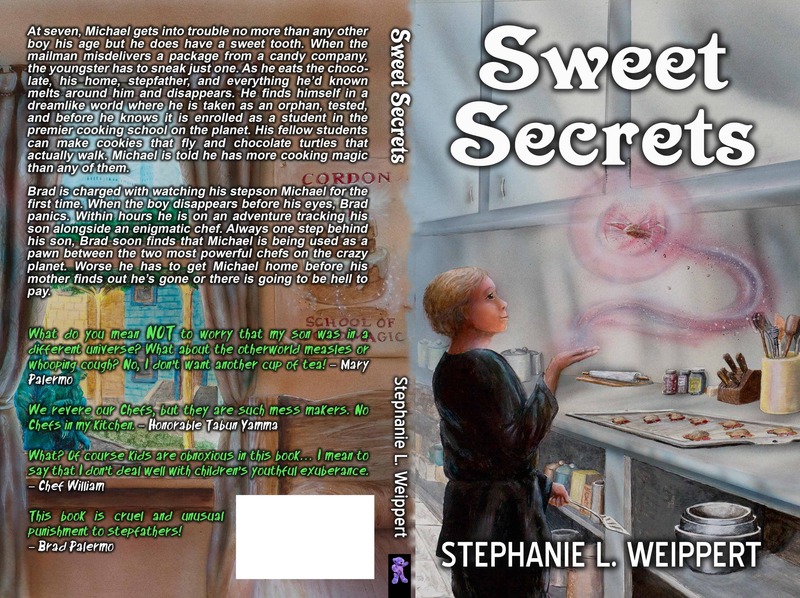 While Brad used his body to defend the box from the over-eager child, he looked and read the shipping label: Sweet Secrets Candy Company. “Maybe it is for you, kiddo. Did you talk your mom into ordering candy?” Michael didn’t answer, just kept reaching after the box. Michael stopped bouncing and his face looked like he just found out they cancelled Christmas. Michael looked back at him with a pouting lip, but didn’t say anything. His mom would’ve recognized the stubbornness in her son’s eyes as he glared back, but not knowing his stepson as well, Brad thought he had got his message through. Brad waited for Michael to argue, but his stepson stood there silently. They stood facing each other in silence long enough for Brad to decide he could do a quick search of the den as the most likely place to find the number and Michael would obey. However, the moment his stepdad turned the corner, Michael took the nearest wooden chair and slid it over, careful not to have the legs squeak on the tile. He climbed up onto the counter, pulled the box closer and sounded out the words on the label. “Sweet. Secrets. Candy. Company.” His face broke out in a big grin. “Oh yeah!” He poked his tiny fingers in a tear from a mushed corner in the cardboard box and ripped it open. The scent of milk chocolate mixed with spices wafted up so strong that he could almost taste the sweetness already. 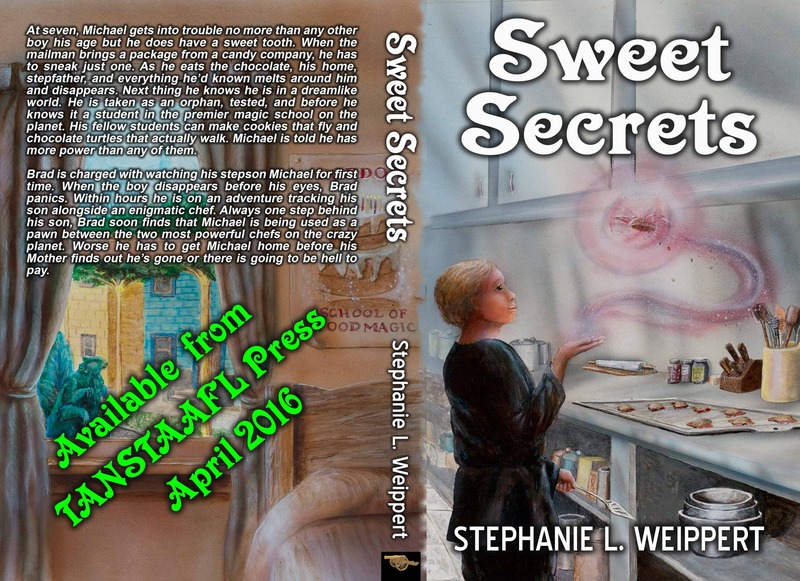 He took another deep breath of the wonderful chocolate scent before he looked down at the shiny silver and brown wrappers in the box. He picked one up and tried to sound out the name. “Train . . . no, tran . . . ssss . . . portal. Transportal? Chocolate,” He shrugged. “Whatever.” Just because he hadn’t heard of any candy with such a funny name didn’t mean it wasn’t good. The label confirmed what his nose told him, and that was all that mattered. He ripped the back of the brown paper wrapped around the shiny silver and tossed it away, then tore the foil down the length to reveal the milk chocolate goodness. Brad returned just in time to watch Michael, with the end of a chocolate bar in his mouth and a shocked look on his face, fade away. The kitchen faded into swirls of color that looked like what happened when you finished a video game level and warped to the next one. His tummy felt bad, like he might throw up, but not really. The colors grew darker and Michael thought he saw mean eyes and sharp teeth that opened wide to eat him whole like the big, bad wolf from fairy tales. He closed his eyes and put his hand tight over his face. When no teeth chomped and the funny feeling left his tummy, he peeked between his fingers. Instead of the familiar kitchen at home, this looked more like the living room Grandma never let him play in, except all the furniture had sheets over the top of them instead of afghans and plastic. A bit of daylight filtered in from the thick curtains to his left, but there wasn’t much to see. At least the scary-teeth faces were gone, though he didn’t see anyone else either. He put his hands down and realized he no longer kneeled on his mother’s kitchen counter, but on one of the dusty sheets on top of some cushions. His eyes got wider and wider as he saw what surrounded him now. Instead of his mom’s cheery yellow kitchen where he did his homework every weeknight, this fancy room had dark wooden carvings on the walls where it met the ceiling with some more around the opening into a hallway behind him. To Michael it looked like the carving around mom’s full-length mirror upstairs. The thick blue-gray curtains looked heavy enough to break the curtain rods he had at home; good thing this one hung from a thick black metal one. A white brick fireplace faced the couch he kneeled on, empty and clean of ashes. The shelf above it had a wooden clock in the rounded shape of a dirt mound. When he focused on it, his ears caught its faint tick. Two large glass balls attached to fancy curlicue rods made from the same metal as the curtain rod looked kind of like light fixtures. Between them was a low piece of furniture with a flat top covered with another sheet. No doubt, he wasn’t at home anymore. He still had the last few bites of the candy bar, and Michael almost flung it away, but hesitated. He really liked chocolate, and if this chocolate bar took him here, maybe more of it would take him home? He stuffed the remains in his mouth, and waited. While it tasted just as good as before, nothing happened. He swallowed it all and waited some more. Still, nothing. When he realized he didn’t have a way back home his stomach clenched in terror. He grabbed at the sheet underneath his knees and pulled it up over his head. Since nobody could see him, he let himself cry. After he cried enough to give him a runny nose, his tummy decided it wanted more than just a candy bar for lunch. He wiped his eyes and nose on the sheet then stood. The light from the window had faded and took on a reddish color, which made all the sheets on the furniture look pink. When he slid off, the sheet around his shoulders followed him to the floor, it uncovered the long pale-yellow couch without pillows He kept the sheet he’d wrapped up in around his shoulders as he explored the strange, empty house. When he brushed his hand against the nearest wall, it came away dusty, but revealed tan wallpaper with a shiny silver design made up of curves.. Most of the sheet’s length dragged on the floor behind him, wiping a clear path in the dust. The archway behind the couch led to an entryway just like the one at home, except for a narrow window next to the double doors, and way above his head hung a complicated tangle of tarnished silver. He thought it might be another light, but if it was, somebody had taken all the light bulbs. He wondered why he didn’t see any spiders up there, then figured he just couldn’t see them in the faded sunlight from that narrow window. When the light faded some more he had to put his hand against the wall to guide him as he walked farther down the hallway. His hand touched what felt like a round knob that reminded him of the volume control on his mom’s computer speakers. He twisted it. He heard a click then lights above his head turned on. He looked around and found the same sort of rods that had glass balls in the living room. As he turned the knob, they started out bright then dimmed the more he turned the knob. He played with it some then twisted to get them bright again. Now that he had light, he could see that these walls had the same wallpaper as the living room, and frames hung along the left wall covered with some light-brown cloth with stitches in crossing lines like a bedspread. Still no spider webs though, bummer. He moved closer and the covering felt as rough as the cover his mom put over the air conditioner each winter. He peeked behind it, and found a real painting like what he had seen on that museum trip last summer. This one showed a dark-skinned man dressed in white with long, tightly braided hair putting apple slices in a pie crust. An oven with yellow flames took up most of the background. A group of three adults with impressed expressions stood off to the right, watching. Michael’s tummy growled in impatience, so he let go of the cloth on the fancy picture and moved to the end of the hall. He pushed open the swinging door into darkness and had to run his hands over the wall until he found another knob to turn. After he found one, he grinned. This looked just like a kitchen, with a thick wooden table, shorter than the one at home, filling most of the floor space. Some of the appliances looked odd, but were close enough to the ones at home that he knew the thing to his left in between the cupboards was the refrigerator, straight ahead was a sink, and to the right was an oven. He dropped the sheet from his shoulders and opened the refrigerator first, but not only was it empty, it wasn’t cold and had a funny smell. He figured it must’ve been turned off when whoever lived here left. Bummed, he let go of the door and it slammed shut. The loud sound echoed in the empty house and made him jump, but nothing happened. So he opened each cupboard door next to it on the search for food. The cupboard doors he opened had non-food items—dishes, mixing bowls, and cups; the only food that he found happened to be an unopened box of graham crackers. The scent when he lifted the lid made his tummy gurgle. He unwrapped the top cracker and took a bite, then decided he was thirsty, and got a cup from where he’d found them. The handle of the funny looking faucet moved back and forth instead of turning like at home, not to mention water came out of the side of the pipe that reached out above the sinks instead of the bottom, but after some experimenting, he got some water in the cup. He shuffled back toward the couch, cup in one hand and graham cracker in the other. He watched his feet on the hardwood floor and wished so hard that Brad would find him. He’d only eaten a bar of chocolate, not run away. That scared feeling came back, and he prayed like in Sunday school for somebody to come. He took another bite and almost ran into a set of adult legs. “Here. Who’re you, young man?” a woman’s startled voice asked. Michael blushed and looked away in shame; his words came out in a rush. “Um, some candy got delivered to our house, and I took one even though Brad, he’s my stepdad, said not to ’cause they don’t belong . . . um, didn’t belong to us. And when I ate . . . ate one, I got this weird feeling all over and things went swirly and I shut my eyes, then when I next looked, I was here.” When he finally ran out of words, he looked up at the woman with his best innocent look. Too bad it never worked. She put her hands on her hips and frowned at him. “You got into a Chef’s chocolate bars when you were told not to and ended up where you shouldn’t. Well, I think you got what you deserved, you did.” She grabbed his arm before he could stop her, and Michael just knew he was in for a spanking, but she only took him with her down the hall. She dragged Michael upstairs and into a big fancy bathroom. The tub looked like a tub, and the sink looked sort of like the one downstairs, but he had no idea what that sloped white porcelain thing was. “Well, now,” the woman said to Michael as he stared at it. “Haven’t you ever seen a toilet before? Are you one of those gutter brats that’ve only seen outhouses?” She gave him the stink eye as she asked. She harrumphed, but didn’t argue as she turned on the faucet to run a bath. “Now, you’ll get in here and clean all that horrible dust off you. I’ll go get a towel for you, then tidy up a bedroom here for you to sleep in tonight. I think I can find an old nightshirt you can wear while I clean those filthy things you have on right now. If the Chef or your parents don’t show up by tomorrow midday, I’ll have to take you to the Prefect. He’ll know what to do with ya. Lord knows I haven’t the time to take care of the likes of you. Now get in.” She pointed at the water. The last thing Michael wanted to do was take off his clothes in front of a stranger. To stall for time he asked, “What should I call you?” and took a step closer to the tub to look into it. This woman kind of reminded him of his Grandma Michelle, nice when you minded, but scary if you didn’t. He figured if she wanted him to take a bath, he’d take a bath, whether he wanted to or not. She bustled out, and Michael quickly stripped off his clothes and got in the warm water. Brad swore he felt his heart stop in his chest. “Oh my gawd! Michael!” He called out for the kid in the tiny hope he was still in the house. “Miiii-chael.” But he got no answer. He ran upstairs and called. No Michael. He rummaged in closets, expecting to find a giggling child, but no luck. He ran out the sliding doors to the deck and looked under the grill. Next, he searched the backyard. Not even a glimpse. He dropped into the deck chair with his head in hands and tried not to panic. The only thing he could think to do now was grab the torn wrapper and the opened box and run to his neighbor’s house to demand what happened to the boy. Mr. William Machacino ordered these cursed things, so he better have a way to bring his stepson back or Brad just knew his lovely bride would make herself a widow when she found out he lost her only child. Brad ran to his new neighbor’s house and pounded on the door with his fist. When the door didn’t open he demanded to be let in and pounded some more. The thought that his brand new neighbor might call the police crossed Brad’s awareness, so he almost returned home to call instead when the door burst open. His neighbor’s eyes narrowed at the box at first, but went wide at the fantastical story. He pulled Brad into his house and quickly shut the door, locking it behind them. His long braid hit the box as he spun around to face Brad once more. His expression unreadable, he silently urged Brad into the kitchen, straight back from the door just like their house. “Set the box on the counter,” his neighbor ordered and pointed. Brad set the box down and looked with mouth-watering envy at the deluxe gourmet kitchen. While it might have had the same location as the one at home, this was the kitchen of Brad’s cooking dreams. He mentally drooled at the steel workspaces, butcher-block countertops, island range hood above a Wolf eight-burner stovetop with grill and water spigot to fill pots, two sinks, twice as much storage as he had now, and the restaurant-sized double oven. “Now that we are alone, please explain it once more at a less-panicked pace.” His neighbor brought Brad’s attention back to the crisis at hand. His neighbor’s face flashed red with rage, then returned to normal as his eyes met Brad’s panicked gaze with the steely calm of a larger-than-man-sized tiger. Concerned he might be next on the grill, Brad took a step back and forced himself to calm down. Brad followed him upstairs to what was his wife’s office at home, except William had filled the room with garment racks full of oddly styled clothing in shades of gray, white, and black. William pushed through the racks to get to the closet, and Brad followed. Instead of black, gray, or white though, these were subdued browns and blues. He flipped through the hangers and pulled out a steel-blue, padded tunic with crossed spoons embroidered in white on the left breast. It looked like it tied and buttoned in the front. Brad had never seen anything like it before, and it took a minute to realize William held it out for him to take. Too worried to question his neighbor’s authority since he knew what had happened to Michael and Brad didn’t, he followed the instructions without protest.